Purchasing and Supply Chain Management 2 Edition The Second Edition of Purchasing and Supply Management focuses on the next generation of professionals as it outlines the most current methods in purchasing and supply chain management. With W.C. Benton’s step-by-step approach, both students and professionals can gain analytical purchasing skills. Real case studies and exercises help students transform purchasing theory into purchasing practice and implementation. Some of the topics include purchasing business processes, price cost analysis, professional services, and transportation, global, and healthcare purchasing.Dr. 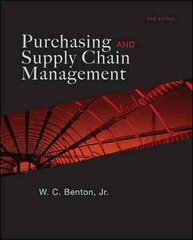 Benton has published more than one hundred articles in the areas of purchasing management, inventory control, supply chain management, quality assurance, and materials management. He has been ranked #1 out of 753 quality and quantity researchers in operations management, has served as a consultant for IBM, RCA, Frigidaire, and state Departments of Transportation, among others, and is the founder of the Purchasing and Supply Management Association (PSMA) at the Fisher College of Business.